Goals: To collect rainwater for irrigation and reduce fresh water use. To create a workable system with a small site and minimal space for storage. Site description:The yard is small, with narrow areas between adjacent houses. The fruit trees and raspberries are irrigated with greywater from the washing machine. Four barrels create 200 gallons of storage. Four rainbarrels are linked or “daisy chained” together along the side of this garage. Inflow pipe turned to side to divert the first rain. 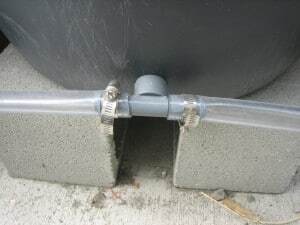 Inflow pipe turned to side to divert the first rain.The gutter is attached to an 1 1/2″ ABS pipe. 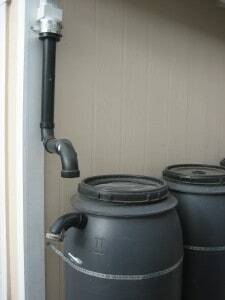 A simple “first flush” diverter option was created by turning the pipe to the side before the first rain of the year. That way the dirtiest first rain is not collected. After the first rain the pipe is turned back over the screened barrel top. The overflow pipe is located at the top of the first barrel. 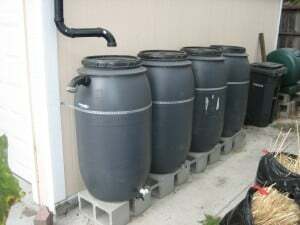 After the barrels are full, any additional rainwater will overflow onto the driveway (which is where the rainwater used to go prior the barrels). In this site the driveway is sloped away from the garage, so no additional piping was needed to move rainwater away from the foundation of the building. Note: Whenever possible, the overflow should be directed to a rain garden or other area that can infiltrate extra water. 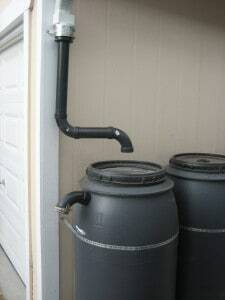 The first barrel in this system has the hose connection. The white piece is a female threaded Tee. 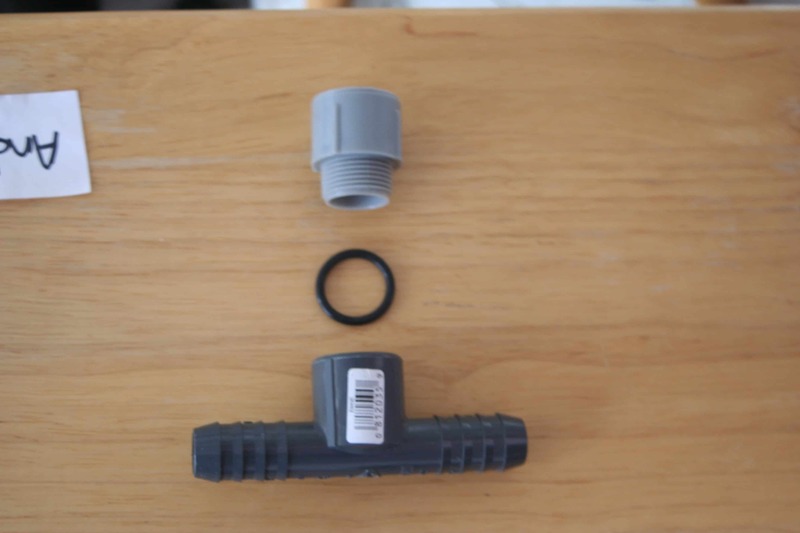 On the left side is a brass “male hose thread to male pipe thread” (MHT to MPT) connector, with a hose shutoff valve connection (the black piece). 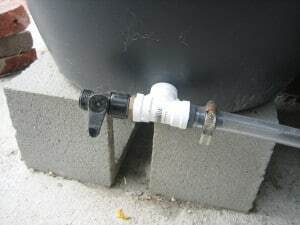 The right side uses a male pipe thread by barbed fitting, the vinyl tube is hose clamped over the barb.In this system the hose connection is on the first barrel because the yard slopes downwards away from the barrels. 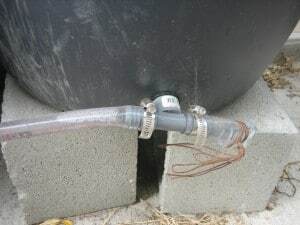 When the rainwater is needed for irrigation a garden hose is attached to the black piece, and the shut off is turned “on”. The middle barrels have a female barbed Tee with a 1″ vinyl tube hose clamped on each end. The last barrel in a string of barrels ends with the tube tied off with wire. This allows for connecting more barrels in the future easily. If no further connections were desired the last barrel could end with a female threaded 90 degree bend, with a MPT by barbed coupling. 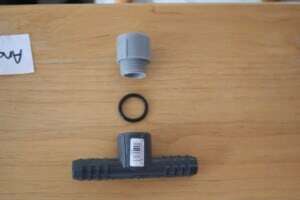 Parts used to connect on barrels: inside barrel– 1 electrical male adapter, outside barrel– 1 rubber washer (not an O-ring) and 1 female threaded barbed Tee fitting. The 1″ tubing fits over the barbed fittings and is hose clamped. Specifications and Notes: The electrical male adapter used in this system is gray, but they are often white. It is important to use electrical male adapters, and not plumbing adapters, because the plumbing fittings have rounded edges and it’s harder to create a water tight seal. Bulkhead fittings can be used to create the water-tight hole in the barrel. They cost more than using the adapters, but they are much stronger and less likely to leak. Maintenance and trouble shooting: Check the screens and make sure they are intact.